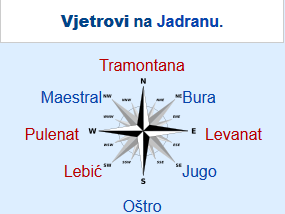 The most common winds on the Adriatic are bura and jugo. The other winds include: maestral, levant, oštro, tramontana and others. 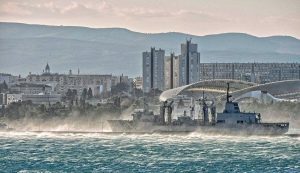 Bura or Bora (NNE to ENE) is the strongest and most famous wind in the Adriatic area, it blows over the slopes of coastal mountains (such as Velebit and Biokovo) bringing cold mountain air at high velocities to the coastal areas and moving towards the sea. It blows more often during winter. There are two types of bura: anti-cyclonal, with cleer weather and cyclonal, also called the dark bura. 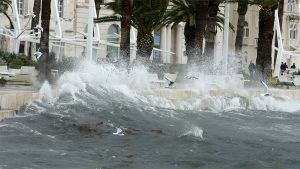 Jugo or Sirocco (ESE to SSE) is a worm and moist air blowing mostly in the area of middle and south Adriatic, usually affecting the whole Adriatic, causing heavy seas. It is also bringing a lot of rain. It usually blows like a south-eastern wind. There are also two types of this wind. Cyclonal jugo is the most frequent variation of south winds in the Adriatic area. Jugo is a moderate to strong wind, sometimes reaching stormy force. Sirocco often blows up to 3 days in summer, but rough seas can remain for a few days. During this storms Blue Cave tour would be canceled. Maestral (WNW to NW) is a wind that blows in the warm part of the year, from mid-May until mid-September. Along the coast it blows like a northwestern wind, but it gets modified by local relief. Levanat (E) is a wind from the east, cold in the winter, warm in the summer. Tramontana (N do NW) is a cold and dry local wind. Of rather short duration – usually after a single day it turns into bura. Oštro (S) is a rather moderate wind blowing from the south, thermal by genesis that “follows the sun” and precedes maestral.